Instructions, alcohol and sharp tools, what could possibly go wrong? The appearance of the model overall is good and captures the feel of the prototype well. Body is satin finished plastic, how this satin finish lasts with greasy fingerprints remains to be seen, detail is very good and the glazing unfortunately has a chunky prismatic look to parts of it. If the pics aren’t up to the normal standard for this blog I apologise in advance, for this entry, images and text, is coming from the workshop, breaking news styley to see how effective it is from my iphone. The pics have been sent to ‘home’ for copyright and cropping before returning to add to the text written in the man cave. What does it run like, well mine wasn’t ideal, one direction it was fine, the other it pulsed slightly, and in both directions stopped occaisionally, enough times to be a concern, so that would need looking at. Cosmetics like the body finish are secondary here, theres no point in having the best looking shelf queen, if the model doesn’t work for me its not worth keeping. In the UK of course at this point you could return it to the retailer for refund or replacement, I rarely do this mostly because the quality is such that you don’t need to, and secondly theres very few items I can’t fix. Once you start deviating from normal maintenance all warranty bets can be off, so you need to be confident of what you’re about. I first ran the loco on a set of rollers to get the chassis warmed up, before using it on Wharfedale Road, which is a small test/demo layout. The track is made to replicate a small run down yard and is not to mainline standard. The loco, fine on rollers or straight track occaisionally stopped and I suspected pick ups to be part of the problem. The easy way into these would be via the base plate, held on by three screws. These came out easily and sure enough the pick ups are phosphor bronze wipers onto the back of the wheel tyre. Keeper plate/rear bonnet and buffer beam filler. I tweeked mine to ensure that they always touched the back of the wheels, I suspect that the original fit didn’t have enough outward force to remain in contact. I can see these being an issue for some people who can’t/wont do their own maintenance, and if not set up at the factory, some of these aren’t going to run reliably. 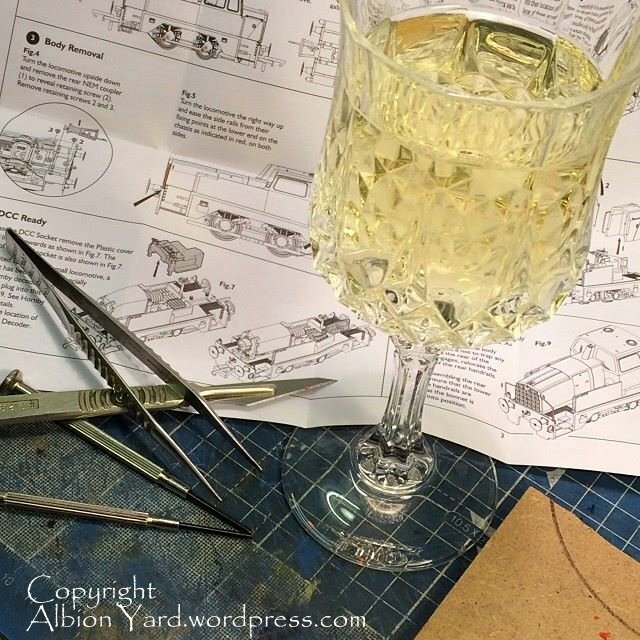 The next item was to clean the ends of the pickups and wheel treads with IPA (not the beer), and a look at the end of the axles showed that the ends had a slight burr on them, which being plastic, I cut off with a scalpel. This improved the running reliability considerably. It did also highlight some areas where I needed to attend to the track too, which was done and it now runs very well across the whole layout. The instructions are pretty good and I followed them apart from the instructional bit. That’ll be the ‘Alpha Male’ bit I suppose. Having taken off the couplings the screws that hold the body on can be accessed, thats where my first problem came in. The body attatching screws were, it’s fair to say, secure. The small bonnet screw is the one to undo first, and this took a significant amount of force to break the seal. The body screw was immovable to the point where the head was getting damaged by the screwdriver and the palm of my hand was bruising from the screwdriver handle. I was using the correct size and shape blade for this too, I have little sympathy with those that damage screws using the wrong blade and then say, its the tools/product rather than the binary thought process involved in getting them there. What was noticeable was the screw mount on the body. 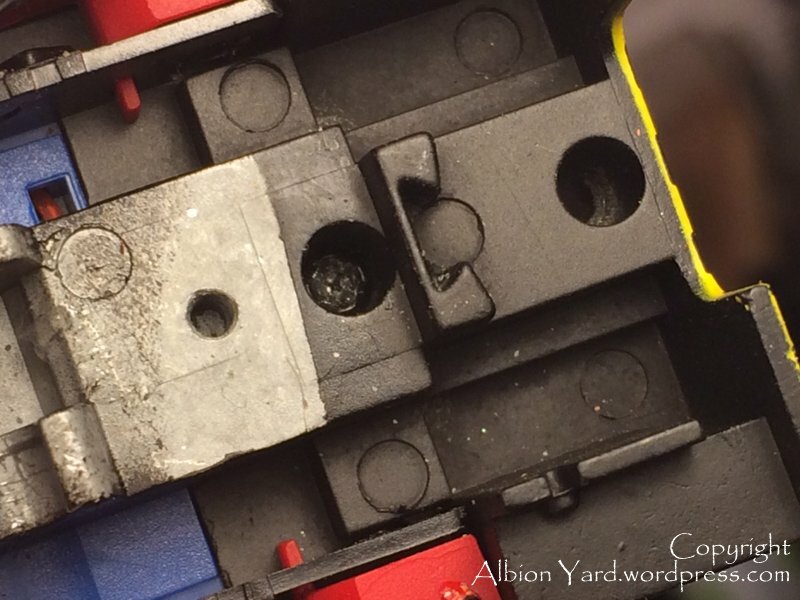 Close examination showed that there were stress witness marks on the plastic which indicated that the screw had been applied far too tight at manufacture. What this meant was there was no way to remove the body easily, the screw was also inside a recessed hole so cutting/drilling the head wasn’t an option, the body of the screw would still be in the chassis and the bodymoulding. Cutting the body would be the only solution, or re-assembling it and giving it back. I could cut the body in two ways, drill a hole and then cut the screw in a keyhole style, but this means not knowing what else you are damaging inside the main body. The easy option is to shave away slivers of the screw mounting to expose part of the screw thread. This will release the pressure on the screw and cause least damage to the body. I had to cut away a far bit of the housing, but this did prove successful and released the screw, which still needed some considerable effort to unscrew it. Slicing sections from around the screw to release it. The first job I did then was to cut a few millimetres of the end of the screw so its shorter but still fixes the body as intended. I could now see the top of the chassis and inside the cab. I think the cosmetics can be improved with replacement glazing, so I’ll ask that nice Mr Shawplan if he’s up for it in the new year. The cab internals with a lick of paint will be fine. If you’re looking to fit DCC sound in one, I think it will be difficult, a sugar cube type may fit the rear bonnet or inside the cab with a very small chip, getting the sound ‘out’ will be the challenge. The core of the chassis is metal, for weight, so some quality drilling and fettling will be the order of the day. The long bonnet logically houses the motor, so a speaker won’t go in there. 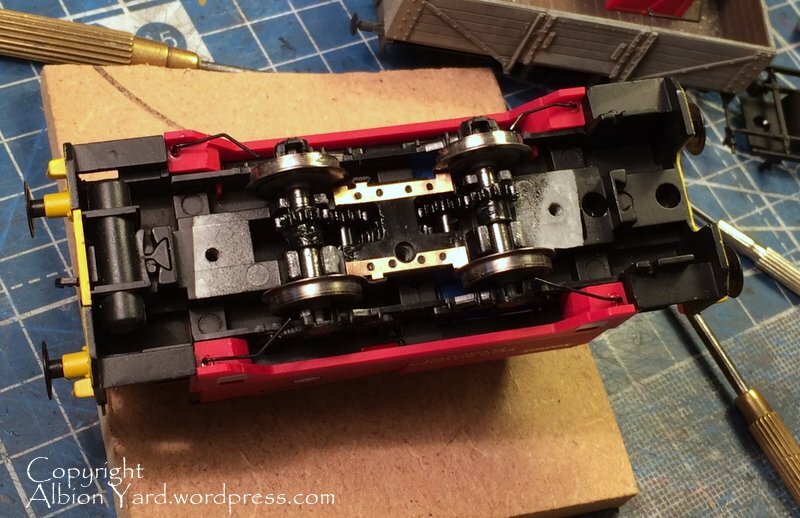 The drive train is a set of plastic gears to both axles. My thoughts on P4/Em conversion are this may not be straightforward. There is little space behind the mainframes/axleboxes this very much being engineered in ‘OO’ and part of the cast chassis block. Axles run in U shaped bearings kept in place by the chassis base plate. 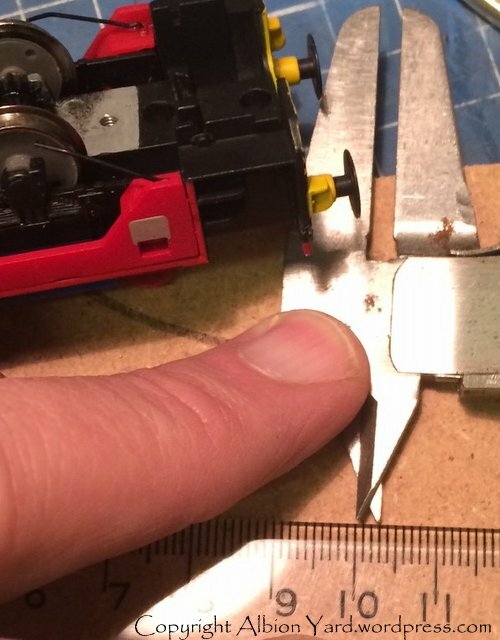 The axles are 3mm diameter from a rough measurement with calipers and ruler. Please excuse the very rough and ready back street engineering approach to measurement. 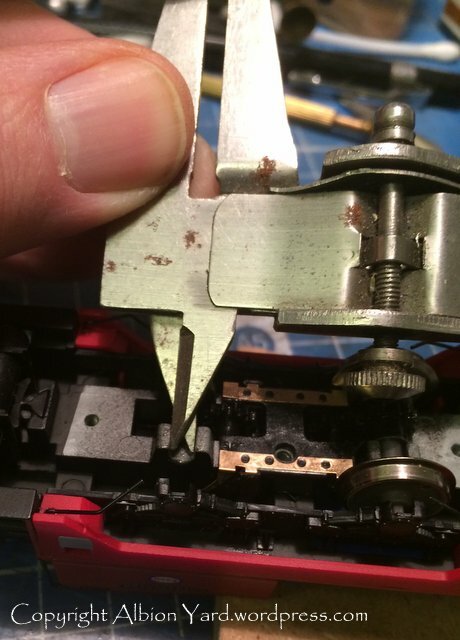 Finer gauges will have no problem with the drive train however, but anticipate significant thinning of the sideframes, or possibly a replacement etch, but that will need a clever fix to the chassis and significant cutting away of the old one. The wheel sets have a metal centre axle with plastic gear set. 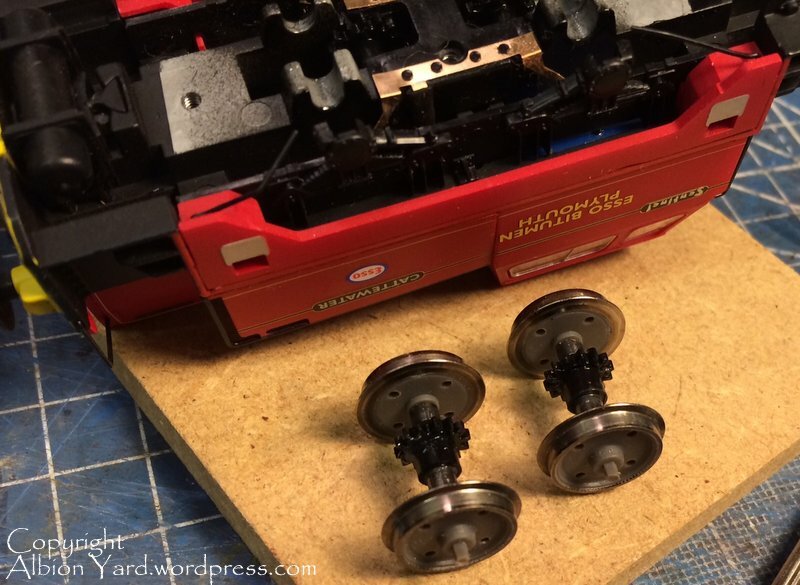 The wheels are plastic stub ends with metal tyres, which means the chassis block is isolated by the plastic stubs, so again it’s not going to be an easy swap for wider scales, possibly a new centre section will be the easy route with turned tyres for P4, subject to the method of fixing the stubs to the main axle. This centre section could possibly be a plastic/nylon material to prevent shorting of the chassis block, depending on how the actual replacement wheel is fixed. 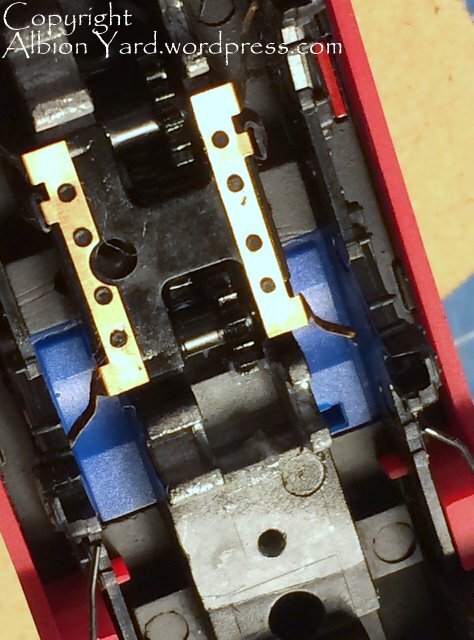 For us not using tension locks the loco comes with buffer beam inserts that fix via the NEM mounting giving the look of a full buffer beam with a panel line. I’m more than happy with this, its better engineered than Bachmann 03/04 blanking plate too, and they’ve even gone as far as engineering removable tanks and brake gear to accomodate this. ‘Design Clever’?, Yup! Is this ‘design clever’ carried out through the model? Yes it is. It deserves to do well, overall it’s well engineered, has the potential to run brilliantly, and launch a thousand box layout, inglenook micro’s all in one fell swoop. The MPD fest is over, the next new thing is micro industrials!, and about time too, I’m going to get a blue one next, for £55 RRP this is real value for money! The sharper observers will note on the instructions a picture of a model with outside rods and cranks. Don’t be surprised to read strident comments about it being ‘the wrong train in the picture’ I rather doubt that’s a mistake, but the reference to the Shropshire and Monmouthshire Railway, however, very definitely, is. Try, ‘Montgomeryshire’ :0). 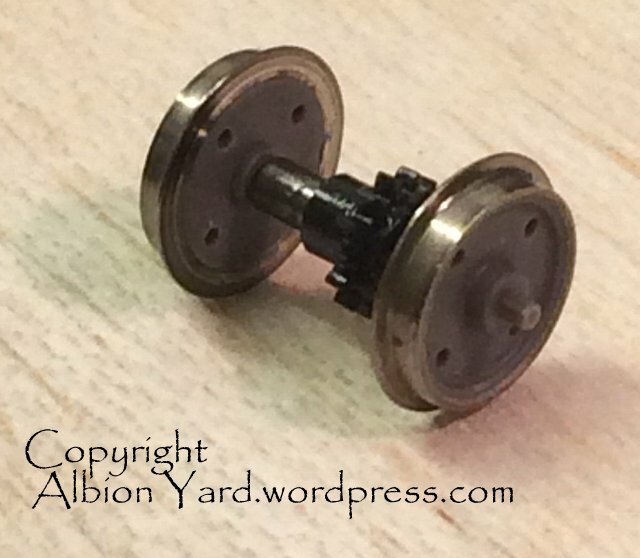 You recall I mentioned the burrs on the axle ends?, close examination shows those to be splined axle ends which would allow easy fixing and retention of coupling rods, and a very easy Hornby release for 2015 of an outside crank version. ‘Design Clever’?, that’ll be a yes then. 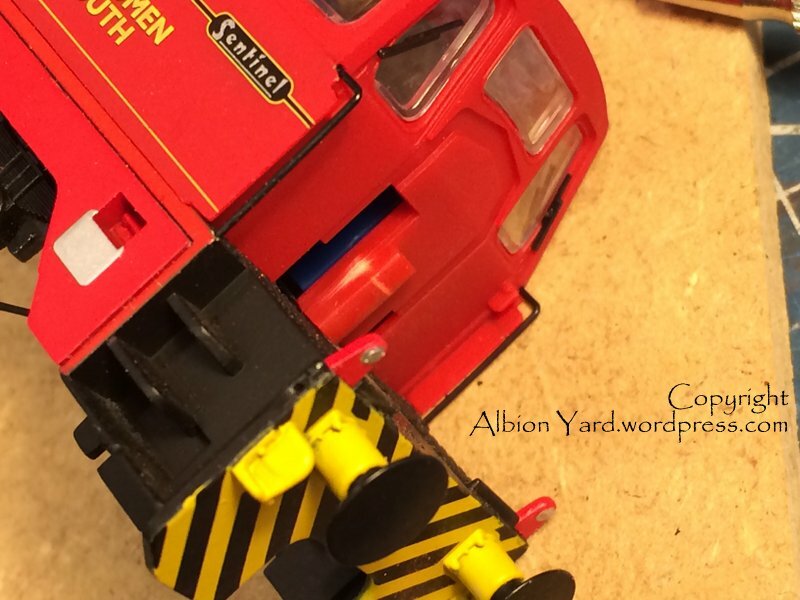 This entry was posted in apple, Bachmann, Branch Line, British Rail, canon, DCC, dcc sound, Exhibition, hobbies, Hornby, humour, Industrial, iphone, Kalmbach, Layout, media, Model Railroad, Model Railway, Model Railway Journal, Modelling, Nevard, OO Gauge, Photography, review, Uncategorized, Western Region and tagged apple, Bachmann, blog, Branch Line, Canon, design clever, Exhibition, HO, Hobby, Hornby, iphone, Layout, life, model rail, Model Railroad, Model Railway, nevard, OO, photography, Railway Modeller, sentinel. Bookmark the permalink. That will be one for me then as it (the Cattewater prototype) lived in my home town! Very interesting. This little loco has been on my wish list since it was announced. I’m sure the Interweb will hate it but people will buy the things by the bucket load. I can see Hornby releasing it in lots of different liveries for collectors and making some very welcome cash too. Everyone wins! Interesting comment Phil, why do you say that? I know there is disquiet about the join line between body and chassis in the side panel – a part often welded up and smoothed over on the prototype. Pre-production models seemed to have over-large axle box covers too. I don’t know if this has changed. The split is likely to be to allow for alternative designs with open handrails rather than a single panel (more Design Clever?) although it could just be production expediancy. For me, it’s the item in the range I have been waiting for. For the price, it is brilliant but then I’m happy to treat it as raw material. I also know how much a kit for the same prototype would cost to buy and build, around twice the RRP. 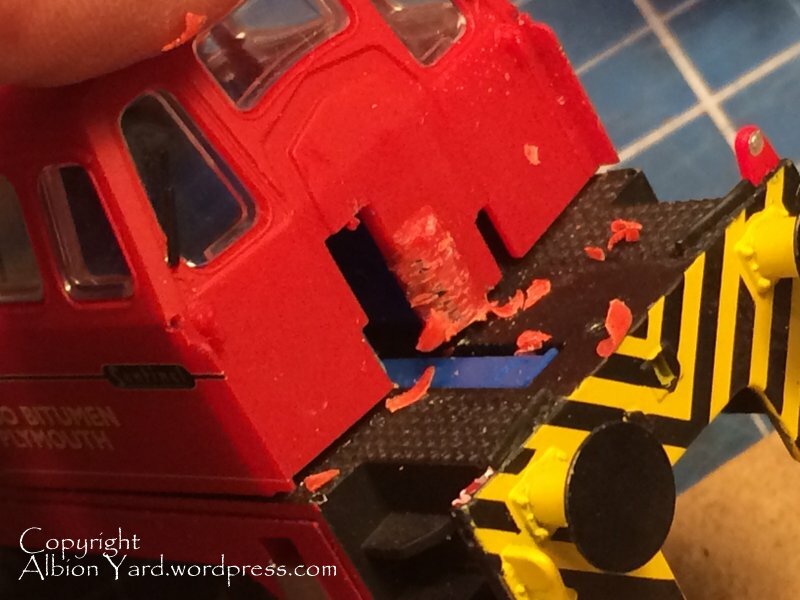 My model will be weathered and detailed if required and I’m going to enjoy doing it, as will lots of other people who prefer to spend time at the modelling board rather than at a keyboard. Seriously, I don’t think anyone should be afraid to express ‘disquiet’ for fear of being labelled as something disparaging and nasty – how else are folk to discuss how to improve things themselves if they can’t talk about any problems in the first place? 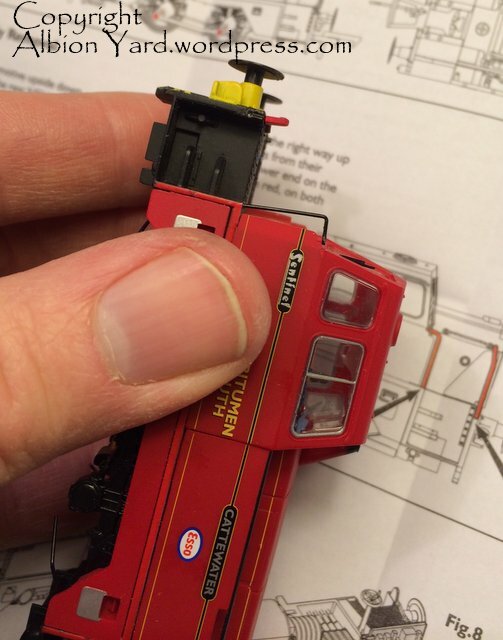 I’ll cheerfully give Hornby credit when it’s due and for what it’s worth, I agree with you entirely on this model – it’s a fantastic and inexpensive starting point, and the plastic finish is irrelevant if you’re refinishing it. What I do object to though is sloppily designed models where the body shape is irredeemable, or that cause unnecessary aggro through their unorthodox construction – like the recent Insulfish van, which fails on both counts. Nice, honest evaluation, Paul. An interesting wee beast. Not without its issues in terms of quality control but neither was that wholly unexpected. Nevertheless an attractive model and I could be swayed by the NCB version. 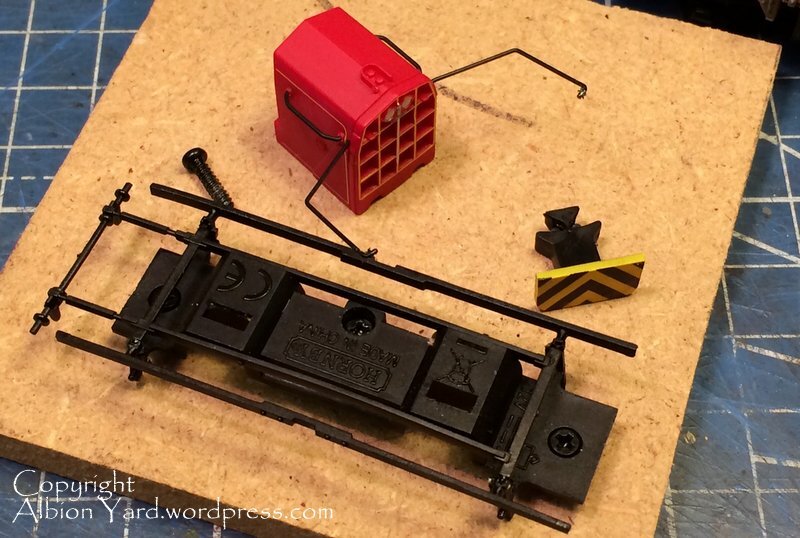 The Insulfish van has a simple solution – build the Parkside kit instead. If Hornby don’t sell RTR vans then they will learn the lesson. In a way, I’m happy with this because it means that those who indulge in modelling rather than just buying still end up with a better finshed product. Can I see a rod drive version on the sheet in this photo? Yup, the chassis has tell tale engineering elements too, like extended splined axles. Sounding very promising! 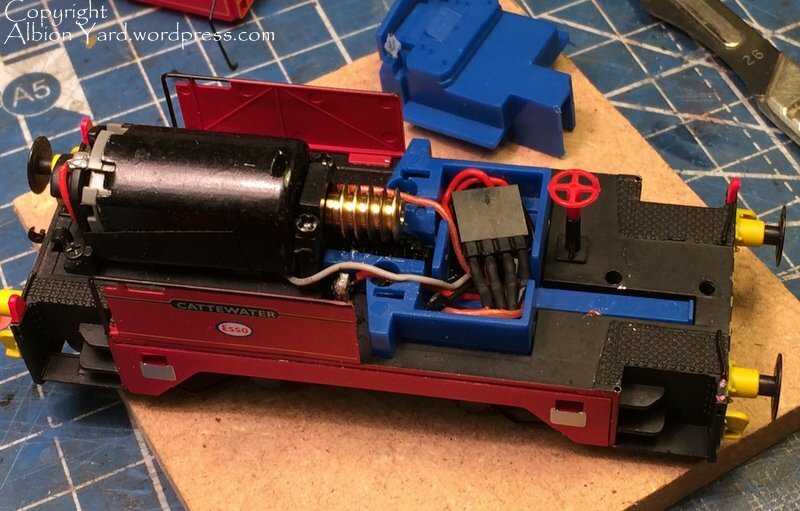 I had thought at first about seeing if it could be converted to one of the rod drive examples (along with the modifications around the valances/bufferbeams) but I think that’ll be a lot of work for no reason now! 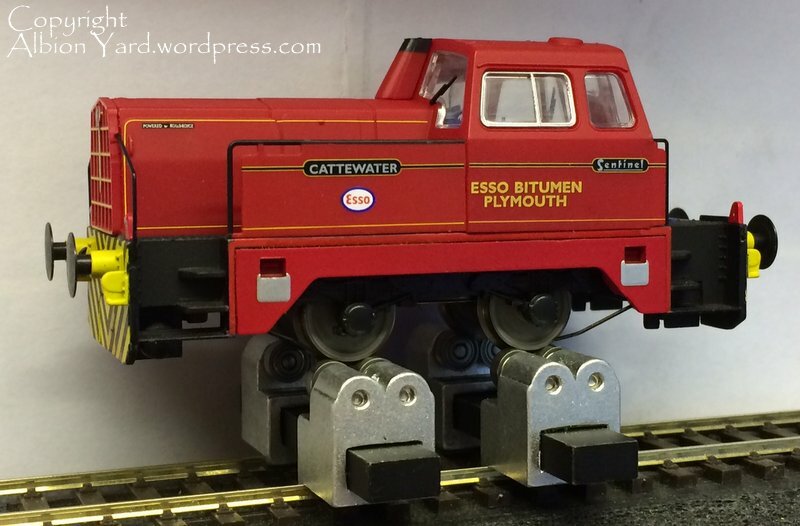 My example which has just arrived is a very nice runner – performing very well on some rather less than clean Peco streamline on a baseboard which has warped a little over the years. I was very impressed with it! Finish in’t perfect and the fit of parts, such as the balance, leaves a little to be desried but even allowing for this it’s still great value! “even allowing for this it’s still great value!” is good to hear. 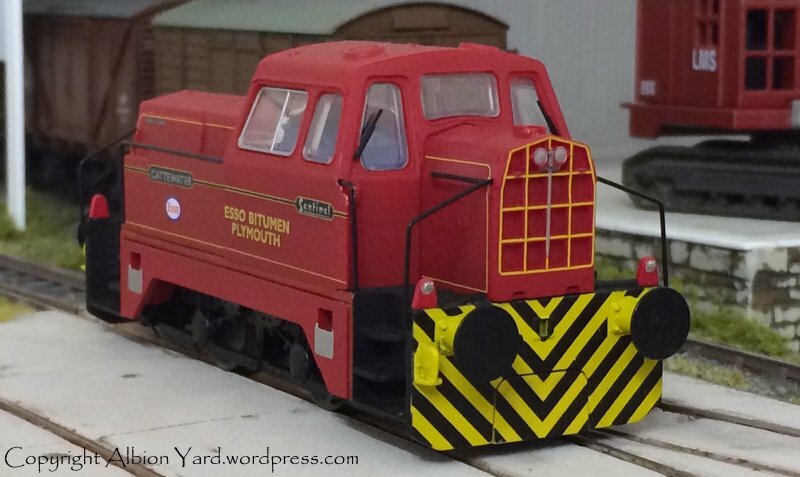 As most kitbuilders will know, this loco is at a price you’d seriously consider spending just to get a power unit. The body could almost be considered a freebie! I really should have proof read my comment! I have to say that even from the point of view of a finescale conversion the model is a great starting point and compared with obtaining a decent kit with wheels, motor and a nice gearbox could easily be twice the price. An excellent article with good photos, thank you. Got mine home today and it ran exactly as you describe with pulsing in one direction, occasionally stopping. Also a nasty ‘crack’ when changing direction which sounded like the ‘crack’ when you accidentally short track power. Almost took it back to shop, but after reading the above thought I would have a go at fixing it. Cleaned the wheels with Servisol 10 = dirty smudges on cloth. Bent the pickups a LITTLE bit Run it upside-down with leads, pushing the axle as far as it will go from side to side to ensure pickups are in contact over the full range of movement. Have one pickup on a wheel and one on the main strip on the other side to help isolate which wheel is not touching it’s pickup, holding the axle in place with your third hand! Couldn’t see any lubrication on the bearings so put a drop of oil on each Back on the track the pulsing and even the ‘crack’ have gone, even without running in. Thankfully I didn’t want to get the body off although the above notes will be useful if I wish to add a crew. In my opinion an interesting and original loco from Hornby given the interest in industrials and micro layouts Quite affordable, being part-way between the Smokey Joe type chassis and something like the 03/08 in price and quality Wheels wobble about when running upside-down, but it runs smoothly despite this. It must be said that I can’t help comparing it to the Factory Direct Trains Trackmobile which for the same price ran like silk straight out of the box and has a crewman – but only one coupling!